Issues #2 and #3 are more closely related to each other than issue #1 and are both the result of the fact that the granularity in the classful system is simply too low to be practical in a large internet. By this I mean that there are too few choices in the sizes of networks available. Three sizes seems fine in principle, but the gaps between the sizes are enormous, and the sizes don't match up all that well with the distribution of organizations in the real world. 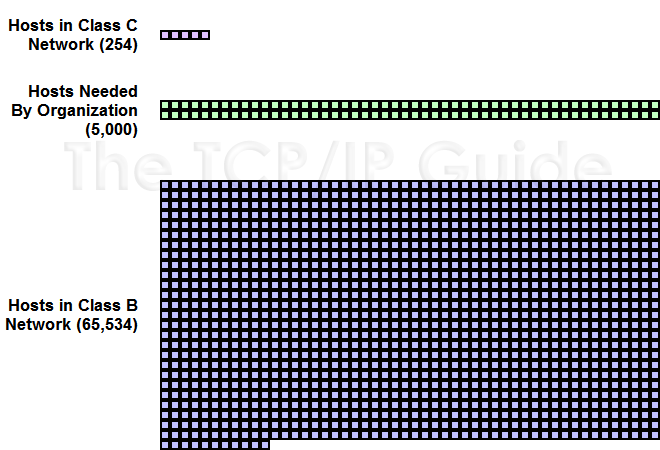 Consider the difference in size between Class C and Class B networksa jump from 254 hosts all the way up to over 65,000! There are many, many companies that need more than 254 IP address but a lot fewer than 65,000. And what about Class A? How many companies need 16 million IP addresses, even the truly large ones? Probably none, if you think about it, yet that's half the IP address space right there. Considering our company with 5,000 computers againwhat class network should they use? As Figure 64 shows, there is no good match for this companys needs in the classful scheme at all. In the past, they would likely have been assigned a Class B network. However, giving a Class B to a company with only 5,000 computers means over 90% of the IP addresses are wasted. When the Internet was young this wasn't a big deal, but as it grew these inefficiencies quickly started to become significant. In this scale diagram, each square represents 50 available addresses. Since a Class C address has only 254 addresses, and a Class B contains 65,534 addresses, an organization with 5,000 hosts is caught in the middle. It can only choose to either waste 90% of a Class B address or use 20 different Class C networks. The alternative to wasting all these IP addresses would be to give the company instead of one Class B, a bunch of Class C addresses. However as you can see, they would need 20 of them. This is more efficient in use of address space, but leads to Issue #3: every router on the Internet replaces the single Class B router table entry with 20 Class C router entries. Now multiply this by a few thousand medium-sized companies and you can see that this method would add dramatically to the size of router tables. Router tables have already been growing quickly as the Internet has expanded. The larger these tables, the more time it takes for routers to make routing decisions.